MIN function can be used when you want to get the smallest value from a set of values. It returns the smallest value from a set of values. 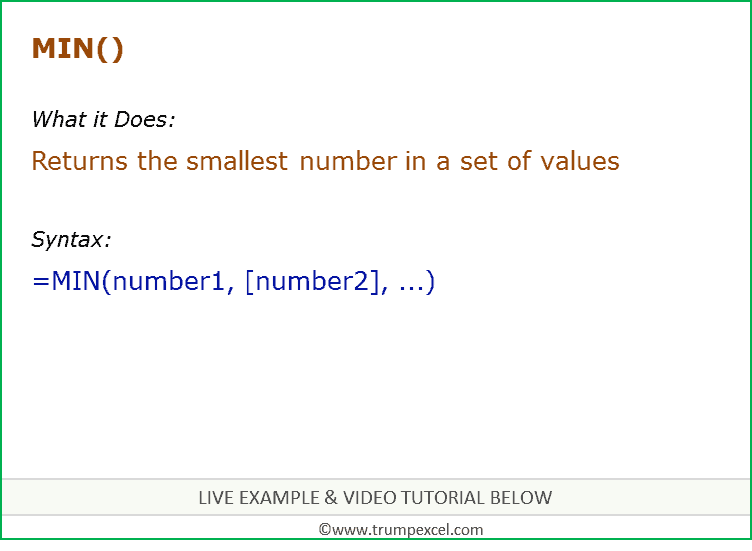 number1 – the first number from a set of values from which you want to get the minimum value. [number2], .. – (optional) second number from a set of values from which you want to get the minimum value. Up to 255 arguments can be used in the MIN function. Empty cells, logical values, or text in the array or reference are ignored. If an argument is an array or reference, only numbers in that array or reference are used. Empty cells, logical values, or text in the array or reference are ignored. If the arguments contain no numbers, MIN returns 0 (zero).